Winter 2017 in Florida - - PAGE 407. Winter 2017 in Florida · · PAGE 407. January 8, 2017: I have been busy on FACE BOOK since the election. I created the account a number of years ago and used it for family only on RARE occasions. A number of Face Book discussions got me involved to voice my opinions which I will not post on this web site. IF you are interested in that stuff, you can follow me on Face Book. You will see my front page photo similar to the one below next to my name when you search for friends on Face Book. This web site is my place for all things aviation and some of my business travels that may prove interesting to some of you out there. 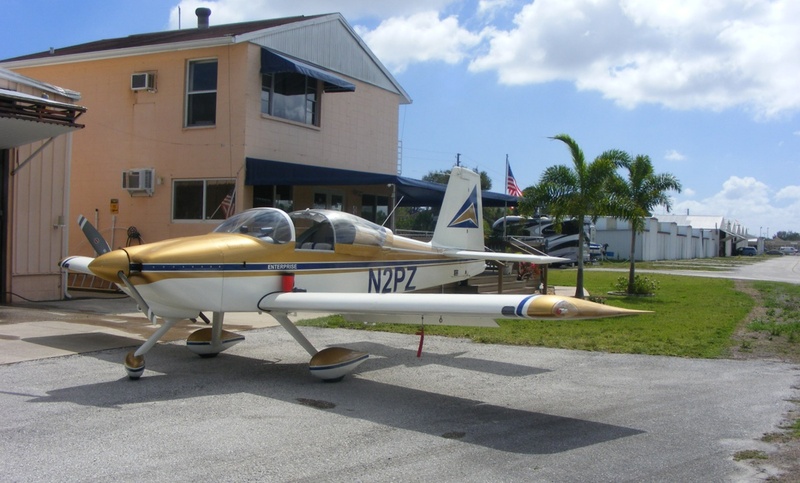 I went to the Rockledge Airport yesterday to catch up on news about the airport and the legal issues that are not yet resolved. 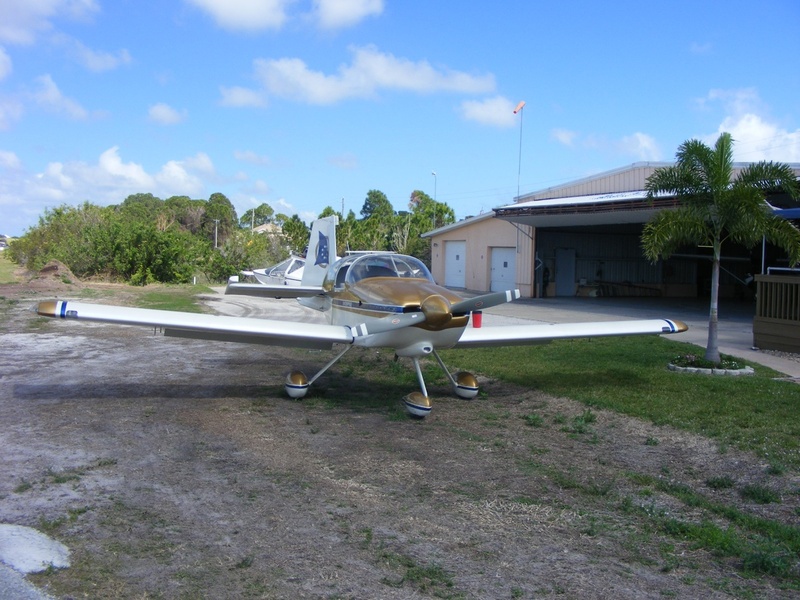 Bill and I talked about my FAA medical certificate status. I have submitted additional information from my cardiologist about the Holter monitor test that had some erroneous data that was corrected and explained in the appeal documents that were delivered to the FAA Medical Office on Tuesday, January 3 by UPS. I will be calling them on Monday, January 9, 2017 to ask if my paperwork has been scanned into the system. February 26, 2017: Sunday and it is time to update the web site with some news about my airplane. I went up to the airport this weekend to run the engine and taxi back and forth on the runway. Last weekend I checked the air in the tires and brought them up to normal pressures. It made it easier to move the airplane in and out of the hangar. One of the airplanes was out being flown today. 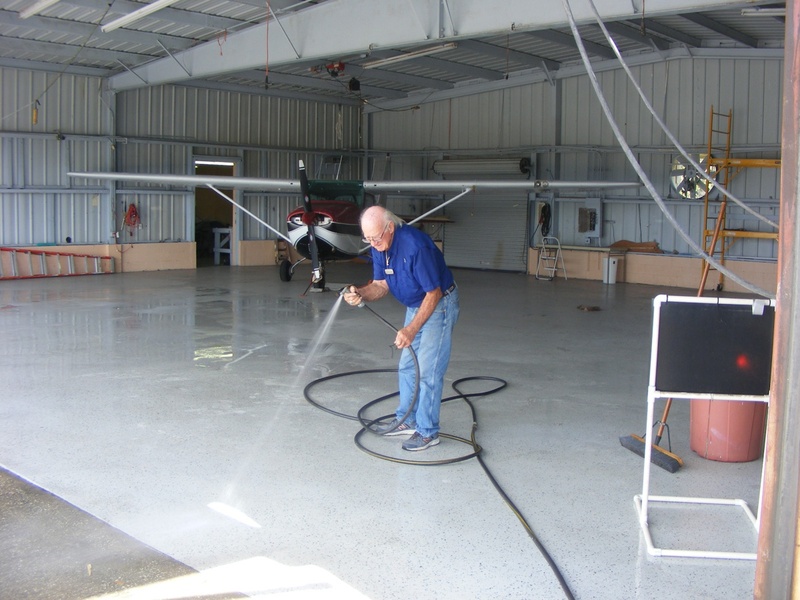 Most of the others were out of the hangar while Bill Simmons is cleaning the floor of the hangar. I took this photo before my engine test on the runway today. The engine run time was about 12 minutes adding another 0.2 hours to the Hobbs meter. With the flaps UP for lest lift, I ran the speed up just enough to raise the nose wheel off the runway on both passes North and South on the runway. I brought the airplane back to the front of the hangar where it will be easy to put it away when Bill has finished his work. No one else on the airport was active when I was here around noon time. Those open hangar doors in the background house an auto repair service that should disappear in April. 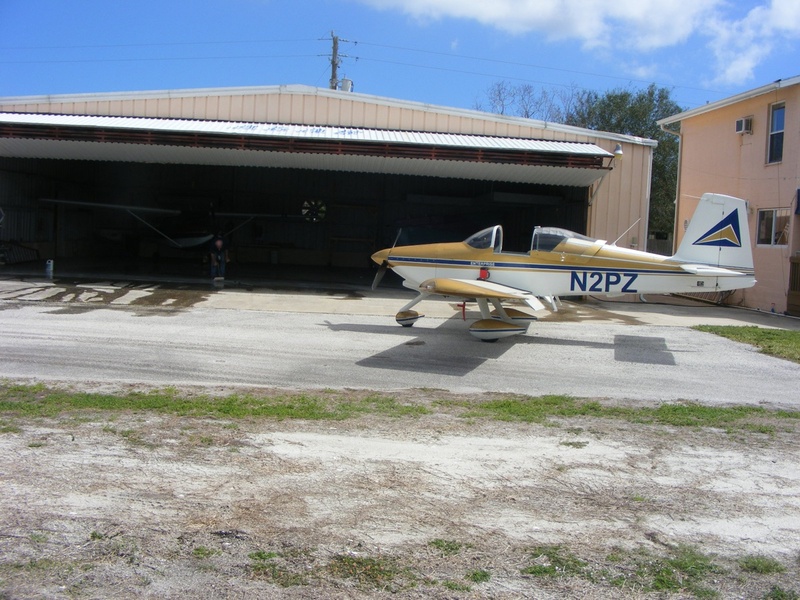 Before I left, I positioned the airplane up closer to the hangar to make it easier for Bill to put it away without my assistance. Dedication to this airport has been his life for many years. Bill has plenty of memories to share about the days when a DC-3 was based here. This airport will change in April as a result of court activity to be revealed when a final judgment goes into effect. I will let you know about that when it is done. As for now, I am still in a holding pattern waiting for the FAA medical branch to reply to my appeal for my special issuance to my Third Class medical testing. March 4, 2017: I had some computer issues this past week. I had to refresh my Windows operating system. All my files were fine, but Windows lost its way and required me to reload my application programs. I have just finished installing my Front Page 2000 and have opened up my web site files and all appears to be working just fine. I will know more when it is time to upload this web page. I expect the computer will upload ALL the web pages, photos, etc. After this session, the next time I publish, this program will compare the web pages on the server and upload only new or changed pages. The publishing part of this program worked perfectly AFTER I saved this edited page. Publishing is just like flying, it helps to practice both skills. PUSH SAVE NOW, then publish. March 11, 2017: Saturday again with my third-class medical certificate (waiver) arrived from the FAA medical branch in Oklahoma City. I called this past Thursday morning and was told my certificate had been mailed to me on Tuesday, March 7. This one is good until September 30, 2017. I will be researching the new Basic Med rules which go into effect on May 1, 2017. The new rules allow up to a four-year term as long as I stay current on my normal medical tests. I will know more about that soon. As for flying, I have to call my flight insurance company on Monday to get that upgraded for flight. Right now, the airplane has been in storage since last year, with engine run testing happening without flying, every few months as reported in these pages. The insurance rate is lower for "not in motion". I expect to make a flight one week from today. March 16, 2017: There was a posting on Facebook today about the upcoming solar eclipse on August 21, 2017. I have been anticipating this event for several years already in hopes of having GOOD weather on that day. 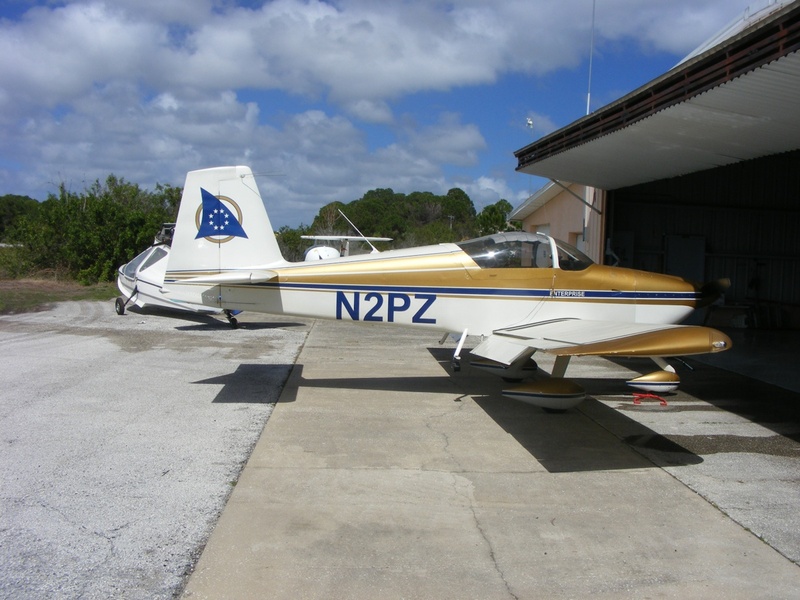 Weather permitting, I am going to fly my airplane up to meet the line of the total solar eclipse East of Nashville at an altitude of 10,500 feet and watch the shadow of the moon racing toward my position. I will then reverse my course to chase the shadow as it heads southeast. I will have my video camera running and taking some snap shots with my digital camera. It will only be a total eclipse for about 2 minutes 40 seconds at that location. I hope I will be able to see the edges of the shadow from that altitude and pan my video camera around on the whole left side of the airplane when I am near the middle of the solar event. 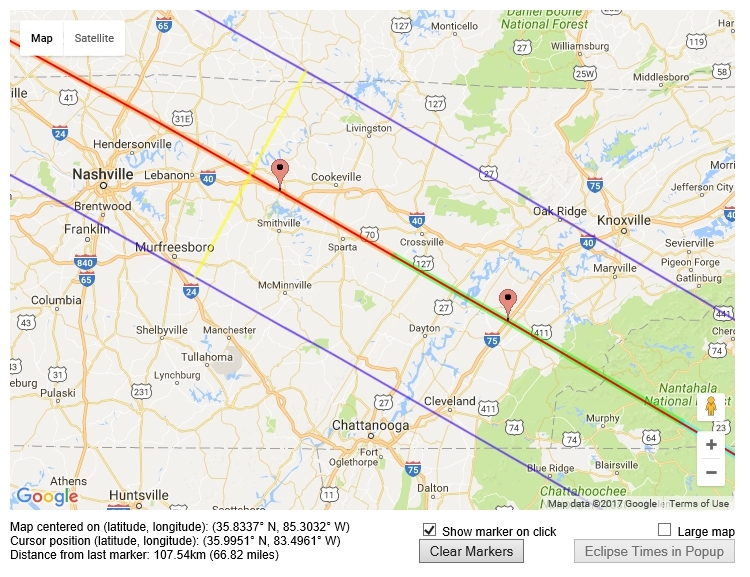 The two markers I placed on the interactive map show where I fly the track of the eclipse from a point directly above Interstate 40 between Nashville and Cookeville southeast to Interstate 75 before heading back to Folks Field south of Chattanooga, where my airplane was based from 2005 to 2007. The segment of the map above is centered on the area I plan to fly during the event on August 21, 2017. The map below shows the path across the USA from Oregon to South Carolina. Use THIS WEB LINK to get to the interactive map above. 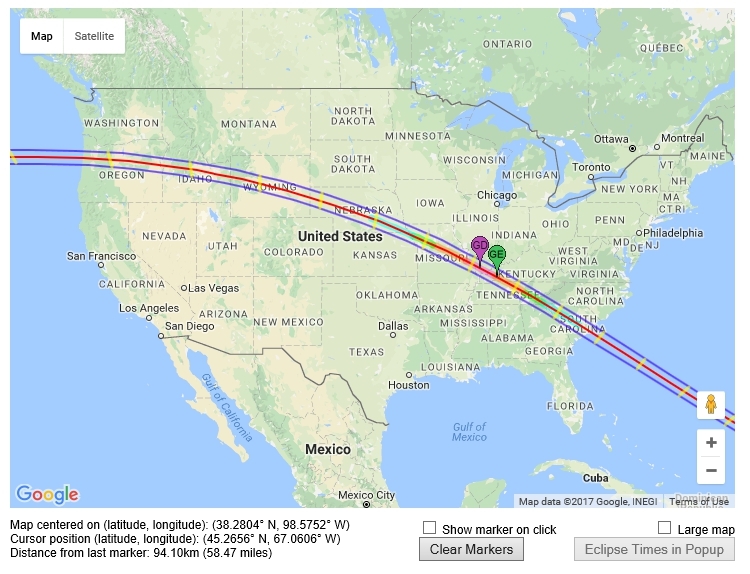 You can zoom in on your area of interest and put your own markers on the track to see what time the eclipse will occur at the marker location you add to the map. Put your mouse on the track and click to put a marker there. A popup will appear there with UTC times and the coordinates where your marker is placed. One more thing today, I have my insurance updated to cover flying again and I hope to fly on Saturday this week. The weather forecast is looking good for Saturday.